I consider myself a lucky girl, I am sent delicious packages of incredible ingredients all the time. Today, I have not only received a brilliant package from Sukrin – they do loads of unusual flours and incredible natural sweeteners, but I also received some Tiger Nut flour. Tiger Nut Flour has been branded as a new kid on the block – and the Paleo community are loving it and it is being widely branded as the new superfood. The truth is Tiger Nuts (not nuts at all but small nut-sized tubers) have been around for many years. Our paleolithic ancestors were eating these. After a bit of research, I find that this flour is a high resistant starch – which means it behaves more like a fibre. It is absolutely packed with fibre and resistant starch – a natural Prebiotic for healthy gut flora. Instead of being absorbed as glucose, resistant starch literally ‘resists’ digestion, and travels through the small intestine to the colon where it is turned into very beneficial, anti-inflammatory short-chain fatty acids by intestinal bacteria. Great news. And even better, I’ve made it into delicious sugar free chocolate chip blondies. They are moist, sweet and have a slight chew to them that really is divine.Try them. 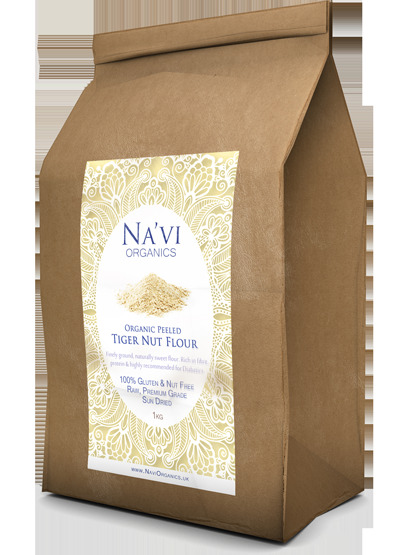 Tiger Nut flour is pretty tricky to get in the shops at the moment, it’s also fairly pricey but as a treat, so worth it. I’ve only seen it in a couple of health food shops, mine is from Navi Organics and has been ground to form a fine flour that is easy to work with. 75g Any good dark chocolate, chopped (Make it at least 70% cocoa butter,it means there’s less less sugar!) or you can use Chocologic’s choc made with Stevia for a Sugar Free version. Pre-heat the oven to 160C and line a tin approx 20cmx15cm with baking parchment. Cream the softened butter and sugar/sugar substitute together until soft and fluffy. Add the rest of the ingredients apart from the chocolate and mix until well combined. Bake for around 15-20 minutes. You want it to retain some semblance of squidge! Allow to cool and slice into 12 squares. NB. Serving whilst a touch warm is absolutely wonderful but they will keep well in an air tight container.